Named after Boy George’s ‘80s band, Culture Club Cheese is a sunflower-yellow deli and restaurant opened two years ago by cheesemaker and monger Luke Williams and his wife, Jessica Merton. The only dedicated cheese it was instrumental, along with neighboring restaurants and bars, in making upper Bree Street a tasty hotspot. The store stocks the most inventive local goat’s, sheep’s, and cow’s milk cheeses and dairy products, including Williams’ homemade probiotic-packed kefir and lacto-fermented kombucha, kimchi, and krauts. Spilling onto the sidewalk is the on-site eatery, which serves fondue, raclette, and salads aplenty (try the melage of roasted vegetables, apples, Foxenburg Estate chevre, and bean sprouts, topped ). Planning a celebration? Order a cake made from stacked cheese wheels and crowned with figs and nuts. In 2010, just as the gentrified suburb of Woodstock was taking off as a culinary and design hub, well-traveled chef Amanda Lewis opened her European-style deli and eatery at the Old Biscuit Mill. (She’s in good company: Chef Luke Dale-Roberts also established the world-famous The Test Kitchen in the same complex). 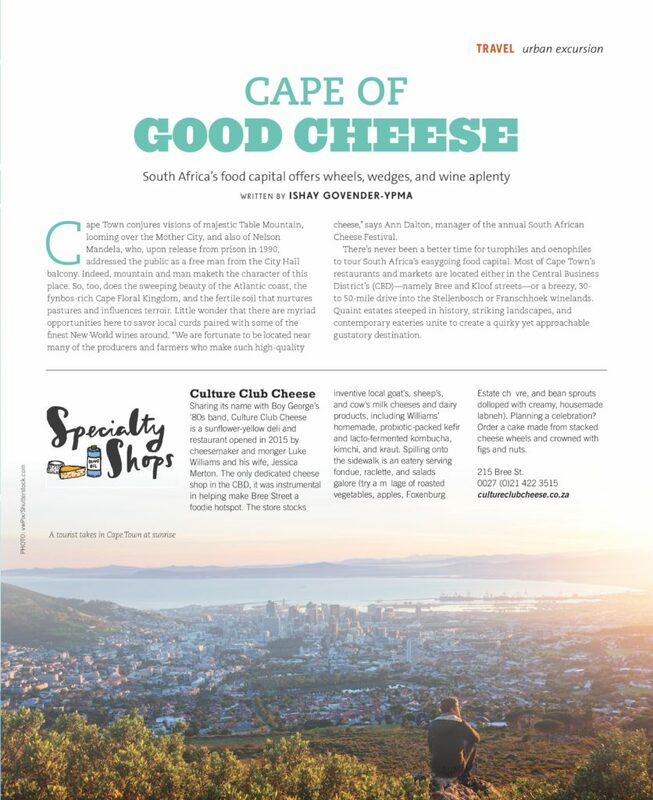 A champion of local produce, Lewis scours the Western Cape for offbeat artisan cheeses, charcuterie, and accompaniments—such as the outstanding handmade brie, camembert, and manchego from Anura Wine’s Forest Hill Cheesery. The family-run Saucisse Boutique Deli—Lewis’ dad, Derrick, often greets diners—is also eco-forward, packaging their to-go cheese-and-charcuterie assortments in recyclable boxes. Inspired by the three-story torre des cabras on the magical grounds of Quinta da Aveleda—a Vinho Verde–producing wine estate close to Porto in Portugal—wine pioneer Charles Back fashioned Fairview’s iconic goat tower in 1981. It overlooks the farm, which turns out cow’s and goat’s milk cheeses; mild goat’s milk cheeses in the White Rock range are studded with dried fruit, nuts, even mango and ginger. The luxuriant full-fat Fairview cow’s milk yogurt is available in select stores around the country. 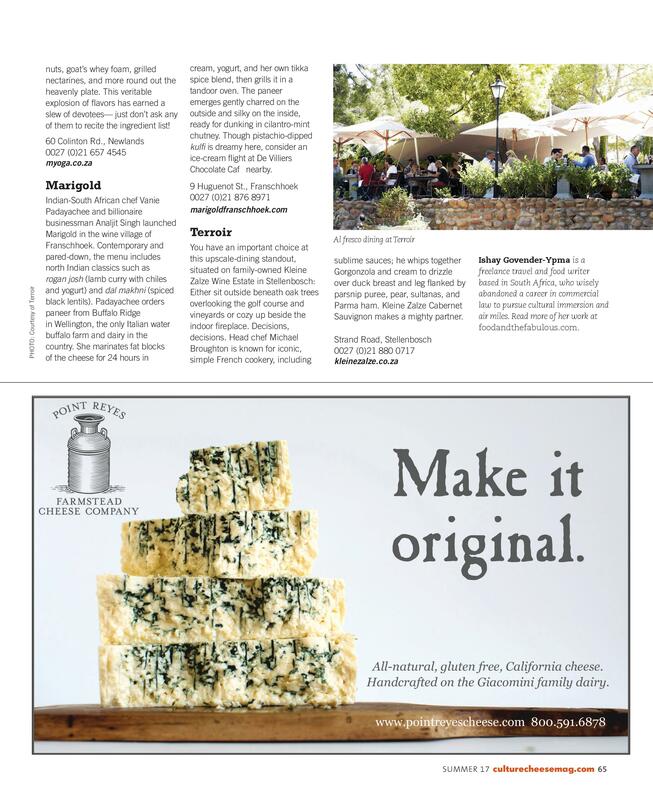 Turophiles can shop at the deli or sample overflowing platters of cheese paired with Fairview wines at the popular on-site restaurant, The Goatshed. 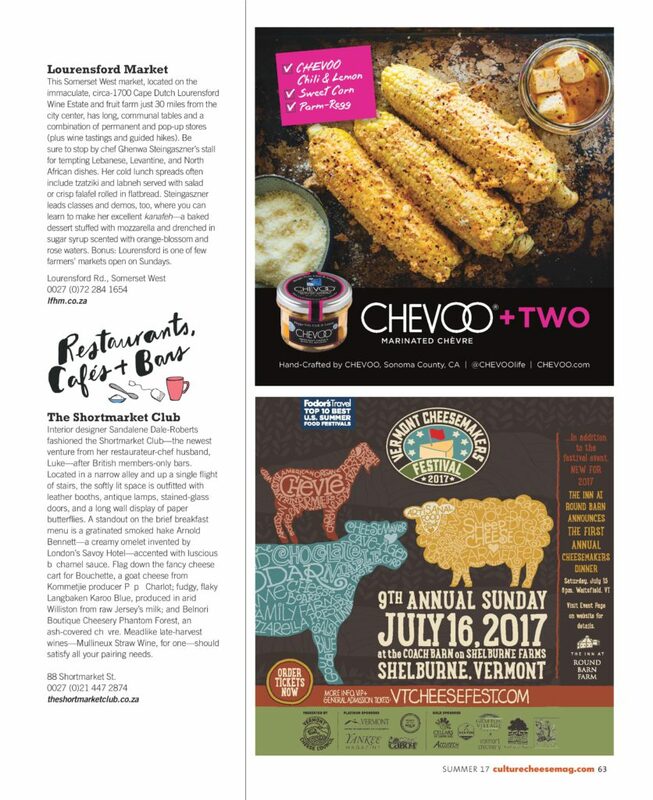 It’s hard to pass up on the black pepper-cream cheese risotto cakes or the “Brunch Tray”—a sampling of the finest estate-made products, including the stellar yogurt—available all day. Crafted using a 150-year-old recipe, Healey’s internationally lauded clothbound cheddar is matured for up to a year in a custom-built facility at Waterkloof Wine Estate (a biodynamic farm in Somerset West cradled by the Hottentots-Holland and Helderberg Mountains). Thrice weekly, French-trained cheesemaker Desiree Stuart sources raw milk in Stellenbosch. Depending on the climate and season, Stuart and her team produce one of three mainstay cheddars: Noble, a nutty rich cheese similar to Gruyere in texture; limited edition blue-veined Waterkloof; and Single Release, only made when . All are nutty and savory and play well with any of the estate’s crisp white wines (). In addition, the estate store sells local charcuterie, preserves, and sourdough bread conveniently arranged in picnic hampers. Cheese Markets Around Cape Town. 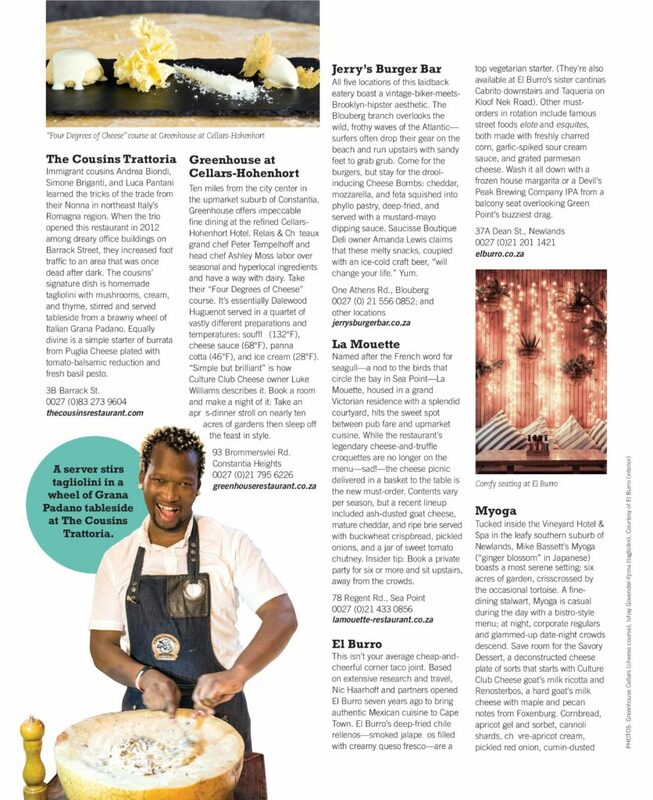 Culture Cheese Magazine Feature. 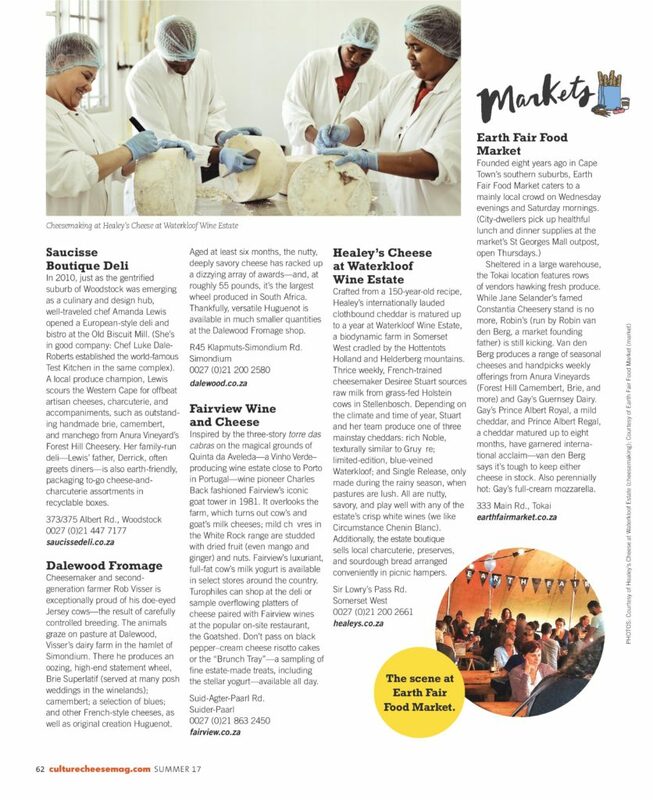 Founded seven years ago in Cape Town’s southern suburbs, Earth Fair Market caters to a mainly local crowd on Wednesday evenings and Saturday mornings. (City-dwellers pick up healthy lunches and dinners supplies at the market’s St. George’s Mall outpost, open on Thursdays.) Sheltered in a large warehouse, the Tokai location features rows of vendors hawking fresh produce—and while Jane Selander’s famed Constantia Cheesery stand is no more, Robin’s (run by Robin van den Berg, in these parts) is still kicking. Van den Berg makes a range of and also handpicks weekly offerings from and Gay’s Guernsey Dairy. Gay’s Prince Albert Royal, a mild cheddar, and Prince Albert Regal, a cheddar matured for eight months, have garnered local and international acclaim—van den Berg says it’s tough to keep either cheese in stock. Gay’s full-cream mozzarella is also perennially hot. Interior designer Sandalene Dale-Roberts fashioned The Shortmarket Club—the newest venture from her restauranteur-chef husband, Luke—after British private members-only bars. Located in a narrow alley and up a single flight of stairs, the plush, softly lit space is outfitted with leather booths, antique lamps, stained glass doors, and a framed, wall-long display of paper butterflies. A standout on the brief breakfast menu is the smoked hake Arnold Bennett—a creamy omelet invented by London’s Savoy Hotel for author Arnold Bennett—accented with Parmigiano-Reggiano and local parmesan-style cheese gratinated over luscious béchamel sauce. Flag down the fancy cheese cart for Bouchette, a goat cheese from Kommetjie producer Pepe Charlot; Langbaken’s fudgy, flaky Karoo Blue produced in arid Williston from raw Jersey’s milk; and Belnori Boutique Cheesery Forest Phantom, an ash-covered chèvre. Mead-like late-harvest wines—Mullineux Straw Wine, for one—should satisfy all your pairing needs. Immigrant cousins Andrea Biondi, Simone Briganti and Luca Pantani tricks of the trade from their Nonna in northeast Italy’s Romagna region. They opened this trattoria in 2012 amidst dreary office buildings on Barrack Street, increasing foot traffic to an area that was once dead after dark. The cousins’ signature dish is homemade tagliolini with mushrooms, cream, and thyme, stirred and served tableside from a brawny wheel of Italian Grana Padano. Equally stellar is the simple starter of burrata from family-run Puglia Cheesery plated with tomato-balsamic reduction and fresh basil pesto. Fifteen minutes from the city center in the upmarket suburb of Constantia, Greenhouse offers impeccable fine dining at the refined Cellars-Hohenhort Hotel. Grand Chef Relais & Châteaux Peter Tempelhoff and head chef Ashley Moss labor over seasonal and hyper-local ingredients and have a way with dairy. Take their “Four Degrees of Cheese” course. It’s essentially Dalewood Huguenot served in four vastly different preparations and temperatures: soufflé (132°F/56°C), cheese sauce (68°F/20° C), panna cotta (46°F/8°C), and ice cream (28°F/-2°C). “Simple but brilliant” is how Culture Club Cheese owner Luke Williams describes it. Book a room and make a night of it: Take an après-dinner stroll through 9.5 acres of gardens then sleep off the feast in style. The five locations of this laidback eatery all have a vintage biker-meets-Brooklyn-aesthetic. The Blouberg bar overlooks the wild, frothy waves of the Atlantic—surfers often drop their gear on the beach and run upstairs with sandy feet to grab some grub. Come for the burgers, but stay for the drool-inducing Cheese Bombs: squished into phyllo pastry, deep-fried, and served with a mustard-mayo dipping sauce. Saucisse Boutique Deli owner Amanda Lewis claims these melty snacks coupled with an ice-cold craft beer, “will change your life.” Yum. Named after the French word for seagull—a nod to the birds that circle the bay in Sea Point—La Mouette, housed in a grand Victorian residence with a splendid courtyard, hits the sweet spot between upmarket dining and pub fare. While the restaurant’s legendary cheese-and-truffle croquettes are no longer on the menu—sad!—the cheese picnic delivered in a basket to the table is the new must-order. The contents vary with the season, but a recent lineup included Dairy’s (an ash-dusted goat cheese), mature cheddar, and ripe brie served with buckwheat crisp bread, pickled onions, and a jar of sweet tomato chutney. Insider tip: Book a private party for six or more and sit upstairs, away from the crowds. 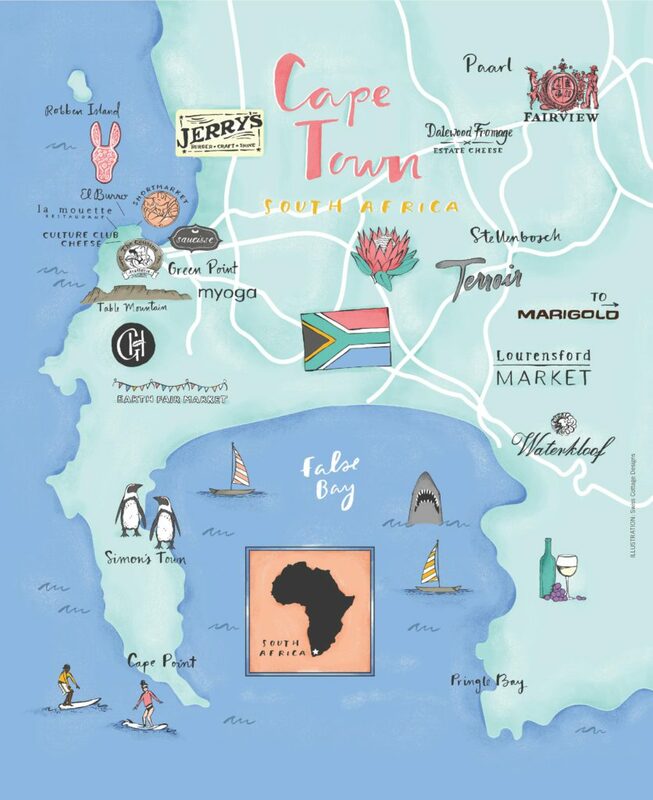 Restaurants Around Cape Town. 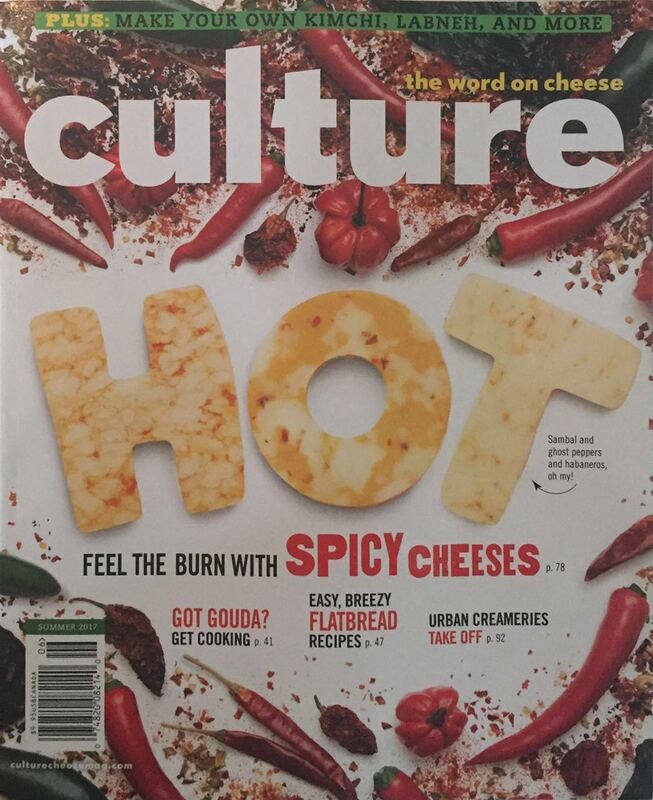 Culture Cheese Magazine. This isn’t your corner cheap-and-cheerful taco joint. Based on extensive research and travel, Nic Haarhoff and his business partners opened El Burro six year ago to bring authentic Mexican cuisine to Cape Town. El Burro’s deep-fried chili rellenos—smoked jalapeños filled with creamy queso fresco—are a top vegetarian starter. (They’re also available at El Burro’s sister cantinas Cabrito downstairs and Taqueria on Kloof Nek Road). Other veggie pleasers in rotation on the menu include famous street foods , made with freshly charred corn, swirled in a garlic-spiked sour cream sauce and dusted with finely grated parmesan cheese. Wash it all down with a frozen house margarita or a Devil’s Peak IPA, from a balcony seat overlooking Green Point’s buzziest drag. Tucked inside the Vineyard Hotel & Spa in the leafy Southern suburb of Newlands, Mike Basset’s Myoga (“ginger blossom” in Japanese) boasts the most serene setting: six acres of garden, crisscrossed by the occasional tortoise. A fine dining stalwart, Myoga is more casual during the day with a bistro-style menu; at night, corporate regulars and the glammed-up date-night crowd descends. Save room for the savoryt that starts with Culture Club Cheese goat’s milk ricotta and Renosterbos, a hard goat’s milk cheese with maple and pecan notes from Foxenburg. . This veritable explosion of flavors has earned a slew of devotees—but don’t ask any of them to recite the ingredient list! Indian South African chef Vanie Padayachee—and billionaire businessman Analjit Singh—are behind Marigold in the wine village of Franschhoek. Contemporary and pared-down, the menu includes pukka north Indian classics such as rogan josh (a lamb curry made with chilies and yogurt) and dal makhni (spiced black lentils). Padayachee orders her paneer from Buffalo Ridge in Wellington, the only Italian water buffalo farm and dairy in the country. She marinates fat blocks of the cheese for 24 hours in cream, yogurt, and her own tikka spice blend, then grills it in the tandoor oven. The paneer comes out gently charred on the outside and silky on the inside, ready for dunking in cilantro-mint chutney. And while the pistachio-dipped kulfi is dreamy here, also consider an ice cream flight at nearby De Villiers Chocolate Café. You have an important choice at this upscale dining standout situated on the family-owned Kleine Zalze Wine Estate in Stellenbosch: Sit outside beneath oak trees overlooking the golf course and vineyards or cozy-up to the indoor fireplace. Decisions, decisions. Head chef Michael Broughton is known for his classic and simple French cookery and sublime sauces; he and drizzles it over duck breast and leg flanked by pear, parsnip puree, sultanas, and Parma ham. A Kleine Zalze Cabernet Sauvignon makes a mighty partner.